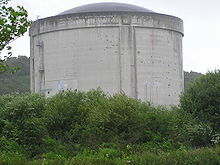 The Commissariat à l'énergie atomique began construction of this experimental reactor moderated with heavy water and cooled with carbon dioxide (HWGCR) in 1962. The reactor had a planned output power of 70 MWe. The plant achieved criticality in December, 1966. In 1971, however, the French government elected to use pressurized water reactor technology developed in the United States as their model design. On August 15, 1975, two explosions slightly damaged a turbine and destroyed a telephone circuit. The Liberation Front of Brittany claimed responsibility. In 1979 the group destroyed electrical lines going from the plant to the grid, and with there being no grid to supply power to, the plant shut down. This was the only time in history that a terrorist group successfully stopped operation of a nuclear power plant. In 1985 the reactor was shut down permanently. The cost of decommissioning is currently estimated to be 482 million euros, much greater than initial estimates. 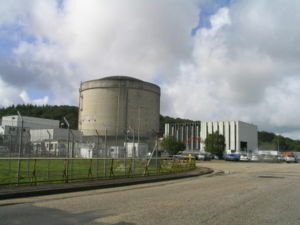 This nuclear plant marks the first decommissioning of a complete nuclear power station in France. EDF and CEA announced their intention to make this a transparent process so that it can be used as a model for future decommissioning operations at other plants. The process is divided into 3 stages. On December 13, 2000, a rise in the ground water level caused a flood in the chemical processing building. In January 2001, a fire broke out in the joint inner building. In 2005, stage 2 was officially complete. Stage 3 consists mostly of containing the reactor pressure vessel (RPV) and is currently underway.